Bayard Construction Company was established in 2000 and specializes in custom designed additions, home restorations, and new home construction with a focus on the highest quality craftsmanship and unparalleled professionalism. Bayard Construction Company began as a referral-based company. We continue to rely on client referrals to grow our business, which means every interaction we have with a client has to be exceptional. John Bayard Velge is a goal driven individual, his main desire and focus in life has always been to become the best and most reputable builder in his class. This relentless strive for perfection and quality is what makes him go the extra mile every time. He has been in the construction industry for over 20 years and he has been building quality custom homes and remodels in the Tampa Bay area for the last 15 years. He has a reputation for not only quality work but reliability and honesty. John Bayard Velge is a member of the Tampa Bay Builders Association and the South Tampa Chamber of Commerce. He has been recognized for his work, as the contractor of a Custom Home that had been renovated in South Tampa featured in Flair Magazine and more recently for a historical project on the Hyde Park Home Tour. 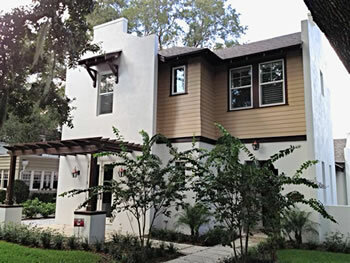 Bayard Construction has completed various custom homes, remodels, and other construction projects in the Tampa Bay area. We have included a few for your review in the completed and current projects section of our website. Our mission is to provide superior customer service and quality craftsmanship at the best value. We build each of our projects to the same high standard of quality regardless of the size or cost. No project is too big or too small; we strive to accommodate every budget. We exceed our client’s expectations with our high standards, quality work, and professionalism. All of us at Bayard Construction Company are proud of being one of Tampa Bay’s premier builders and invite you to talk with us about all your building and remodeling needs.